Trying to catch the hustler again, he stated that if the card was on the bottom it couldn`t possibly be on top, but was wrong again and lost another dollar! In a last ditch effort he guessed that it couldn`t be the center card, but once again lost another dollar! His running total was now up to six dollars. Continuing, the performer tells how he told the hustler that he thought more than three cards were being used, but was once again proven wrong and he lost another dollar! Being the gambler he is, he tried one more time, double or nothing. 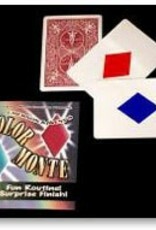 The hustler clearly showed one card with a red spot, a second card with a blue spot and stated all the magician had to do was guess the color of the third card. Red, right? 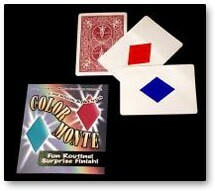 Wrong again-the card isn`t red or blue, but a surprise card no one will expect!Comes complete with the three necessary cards printed on Bicycle stock and detailed instructions.